Ok, so most California Gun Owners are very aware of the GunMageddon Crazy Train that rolled through the Legislator and right across the Governor’s Desk this past Summer. Just in case you were living under a rock and don’t know… the introduction of 11 bills whittled down to 7, specifically detailing strict gun control measures, onset by the horrific terrorist attack in San Bernadino last December, quickly made their way into law by Governor Brown’s final approval. However, many folks are very much unaware that a San Diego Businessman is actually attempting to pull the e-brake on this anti-gun crazy train, through the California Initiatve Process which includes the right to repeal laws by referendum, and his time frame to do so is almost up! 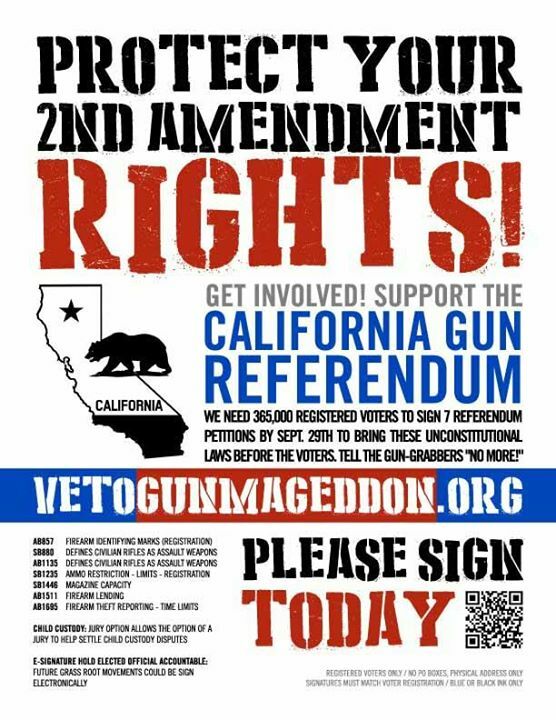 Some say that California has reached a point of no return on its seemingly endless train ride into deeper and greater gun control, but Barry Bahrami, the San Diego Guy, obviously disagrees and has formed a grassroots effort now widely known as, Veto GunMageddon. The movement launched separate petition drives against each of the seven laws back in August. These petitions each ask for ballot referendums that would ask voters to repeal the laws in the upcoming November election. I give huge props to Barry for launching this effort and I personally fully support him. I know that the gun control debate can be one of the worse topics to even mention among some crowds and I’d really likely to steer clear from most political issues when it comes to this blog, but sometimes I just can’t. I’d really love for this blog to be a place to learn. Somewhat of a go-to resource for people trying to learn more! In this particular case, I think this veto attempt is something we can all learn from, if anything its a cool process in our system of government that somewhat helps to put the power back in the people’s hands. Which I prefer! But I also think that these laws are very much threatening our right to own guns. What I am most alarmed about is the ammo grab! When the government begins to restrict our use or take away our guns, they are saying that law abiding citizens cannot be trusted with them. It doesn’t matter to them if you own a gun for self-protection or to be able to fill your freezer with game meat. 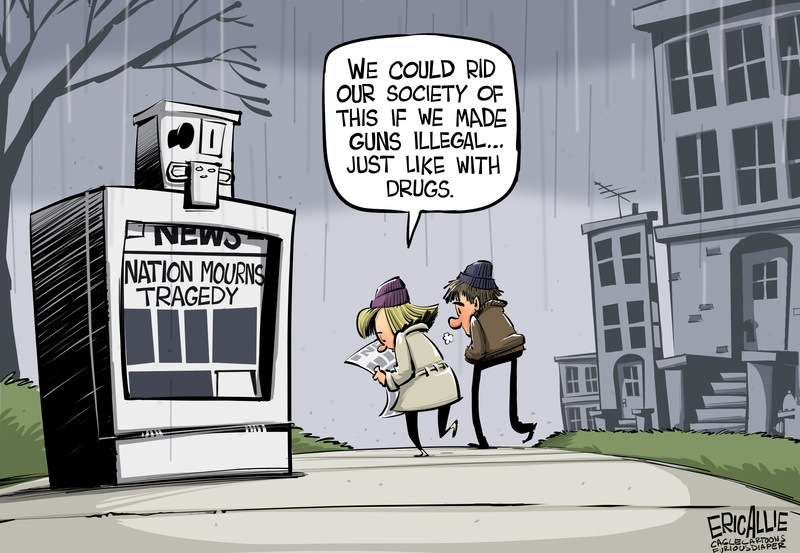 We are all suddenly lumped into a pile with criminals and terrorists and it’s just plain easier to disarm us all. I believe in my right to self-protection, period. Although I like to believe that I am tougher than a two dollar steak, reality is my 5’6″ 140 lbs. is no match to the strength of a large attacking man! The handgun I carry, and the “assault weapon” locked in the safe at our house, levels that playing field. My guns, coupled with my training in handling them, gives me the security that nothing else can! Nonetheless, a gun is useless without the ammunition it requires! Seriously, SB 1235 pushed my bullet button the most! My biggest fear is that it’s all just the beginning of a total ban and they will start by taking our ammo first! Ultimately, the government does not get to decide who has rights and who doesn’t. Our constitution protects us from government over reach and although I would hope that they have our best interests at heart with these new laws, I still truly feel that they will only impact law abiding citizens and not stop gun violence or terrorism from happening in the least bit. I believe in gun control if it works. I have no problem with background checks and actually like the idea of them, if they are followed through with. But many times, background checks only red flag previously convicted felons and have no insight to purchasers who may be on the FBI watch list or under treatment for mental health issues. There is a right way, but these laws are not the answer. So back to Veto GunMegeddon. The Referendum process is restricted to a 90 day period after the bill(s) become law. September 29, 2016 is the 90 day deadline to gather the needed 365,000 signatures to put the ballot referendum proposals to voters in November. The pessimist in me thinks it’s a long shot for Mr. Bahrami and his group, but nonetheless, I signed all of them and hope any true American, gun owner or not, reading this will do the same. And no, unfortunately, you can’t just sign an online petition. You have to actually walk into a petition location, within the county you are registered to vote, to do so. This part of the process isn’t so simple, but it’s worth it. Be sure to call before you head out to sign and make sure they still have the petitions. As we are getting closer to the deadline, petitions are starting to be gathered up and counted at headquarter locations, so you may have to track down the exact location within your county to sign. You can find a location nearest you by clicking here. Before you go, I encourage you to read up and educate yourself on each one of these new laws. SB 880 / AB 1135 which reclassifies rifles with ammunition clips that are detachable or quickly swapped out using a release button as assault weapons, thereby banning them in the state. AB 1695, which restricts our constitutional right for the conviction of a misdemeanor. AB 857, which requires individuals to apply for a serial number from the government before constructing a homemade gun, and outlaws the sale of such guns.